Our Little Miracles: 35 Weeks - We Made It!!! We made it past the final milestone on Tuesday!!! I was so excited! The whole past week has been a little stressful just knowing that I needed to be good so that the boys don't make their entrance into the world too soon. Now, we can just sit and wait for the boys to decide to show their cute little faces :). I had another doctor's appointment on Wednesday. Everything was about the same, except that I am swelling a little bit more and my blood pressure is rising a little, but still in the normal range. The doctor said that he was not surprised at all because that is typical with twin pregnancies. So we will just watch it - and I am to continue to rest. We also did a non-stress test, which monitors the babies's heart rate, movements, and my contractions. Everything was as it needed to be. I think I have gotten a little bigger over the past week, so I am posting another picture just to keep you updated. It is definitely getting more and more uncomfortable carrying the boys, but I know it shouldn't be too long now before we get to meet them. Their daddy has been ready for quite some time - he asks everyday if we can just go to the hospital :). I have been a little less ready because I don't feel prepared, but I have now reached the point that we have the essentials ready and anything else is just extra. So we are both VERY ready to meet our boys! Hopefully soon, we can post some pictures of them :). Christy you look great and we are really happy for you and Phillip! You guys will be great parents! Keep us informed. 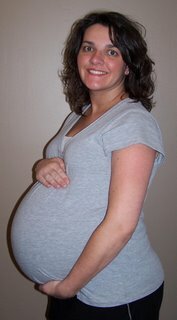 Christy....you are the cutest pregnant woman! 35 weeks is GREAT! I am so happy for you, you have done so good!